Born June 1, 1951 in Bakhdida, Iraq, Yousif Behnam Habash entered St. John’s Seminary in Mosul in 1965 at the age of 14. From 1970 to 1972 he performed military service in Iraq. Thereafter, when the Mosul seminary closed, he completed his seminary studies at Charfet, Lebanon, studying at the Université Saint-Esprit de Kaslik. Yousif Habash was ordained a priest for the Archeparchy of Mosul on August 31, 1975 after which time he was assigned to a parish in his home town of Bakhdida and worked in youth ministry. He later served as vicar and then pastor of Sacred Heart Parish, in Basra. In 1994, he was assigned to the Syriac Catholic Mission of North America, serving first in Newark, New Jersey and, from 2001 on, at the Church of the Sacred Heart of Jesus in North Hollywood, California. On April 12, 2010, he was appointed by Pope Benedict XVI as the second eparch of the Syrian Catholic Eparchy of Our Lady of Deliverance of Newark. 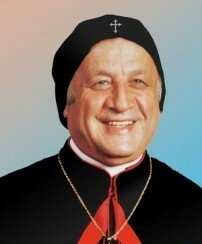 He was consecrated a bishop on June 11, 2010 by his predecessor Ephrem Joseph Younan, who had been elected Patriarch of Antioch and all the East of the Syrians. He was installed on July 31, 2010.